When it comes to your food, the declaration of “locally sourced” is everywhere these days. You’ve seen it: local cheese, local produce, local wine. It’s official; local is “in.” The natural food movement of the 1970’s has changed what we expect when we go to the grocery store – sourcing foods from our local producers is now widely under¬stood to be more ecologically sustainable and economically successful as well as a higher quality choice. Thank goodness! But, what does it mean when local is advertised? This is actually a pretty interesting question because it can mean wildly different things from store to store. It could mean regionally sourced, as in it came from within your neighboring states. It could refer to a small sized farm business, or it could mean multi million dollar farms, which sell within their home state and beyond. At the Olympia Food Coop, local has been a foundational value from day one. It is the bedrock to every choice we make. This value makes me beam with pride every day. I’m sure you know the feeling because at the Olympia Food Coop our local is Co-op local. It is an inspired, un¬wavering understanding that people matter; that this planet matters; that our food matters. Most of all, it is the knowledge that when you come through the Olympia Food Co-op’s doors, you won’t have to wonder exactly where something local came from, because Co-op local is clear. At the Olympia Food Coop, it means that we work directly with the food producer, building longstanding relationships with people and businesses in our areas that love what they do and the food they make. Co-op local is direct, fresh and strong community. Every time. 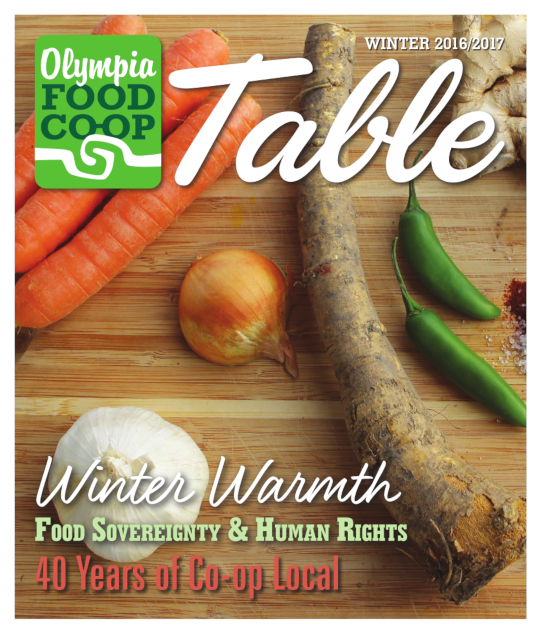 Next year is quite a significant year; 2017 will be 40 years of local for the Olympia Food Co-op. That’s right – forty years of putting the highest quality food first along with the health of small farms, food producers and our local economy. This is no small accomplishment. When I think about it, it gets to the root of why I’ve been a member of the Olympia Food Coop for so many years. As a shopper, I can make my selections with confidence, knowing exactly where my delicious food has come from. And as a staff member, I can see the impact of our Co-op local every time I receive a delivery in the warehouse and sign an invoice from a local producer. Knowing that each of those dollars will circulate within our communities for somewhere around a hundred times before it leaves our local economy, leaves me with a great sense of purpose and pride. I see this phenomenon every day and for me, that is the power of Co-op local. Whether it’s the amazing food, where it came from, or the people we share it with in our lives – Co-op local is something we can celebrate.